They’re groping granny and targeting attractive women for extra body scans. 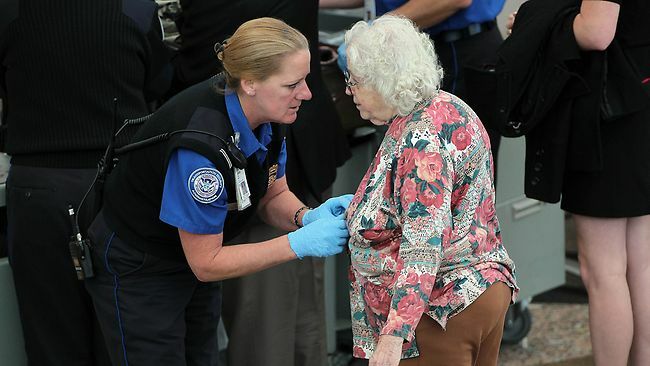 TSA is now using the excuse of a “random search” to scan attractive women at airports. One woman was scanned three times in the completely invasive new body scanners at the Houston Airport. A Dallas woman says she was forced to undergo three body scans by TSA workers because she has a “cute” figure – and she’s not the only woman complaining about passenger “peep shows” at America’s airports. The passenger, Ellen Terrell, is among a host of women who suspect they were randomly selected for body scans not because of any threat they posed, but because TSA workers wanted a closer look at their physiques, according to an investigation by CBS 11 in Dallas of more than 500 passenger complaints about the TSA. “I feel I was targeted by the TSA employee to go through the see-you-naked machine because I am a semi-attractive female,” according to one of the complaints reviewed by CBS. …Terrell told the station she was “randomly selected” for a scan. The agent, she said, was communicating by microphone with TSA staffers in another room, whom Terrell alleged were trying repeatedly to record a better image of her. “They wanted a nice, good look,” Terrell told CBS 11. The female agent asked her to enter the machine three times in the incident several months ago. But the agent eventually lost patience with the requests coming from the other room, she told CBS 11.